A little white and fluffy rescue dog named Cora Rose may not fully realize just how much of an inspiration she has become to everyone around her. But she nearly didn't survive at all. When the dog was brought into an animal shelter in Madera, California, last year, people were trying to decide whether she would be able to have a life that was worth living. 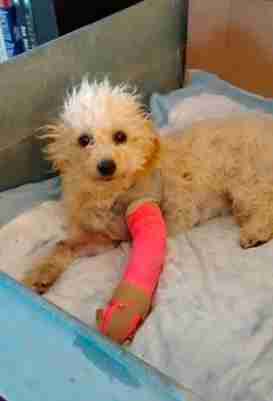 Believed to have been hit by a car, Cora Rose's two front legs were shattered. Her pelvis was also broken. She could hardly move and was probably in a tremendous amount of pain. 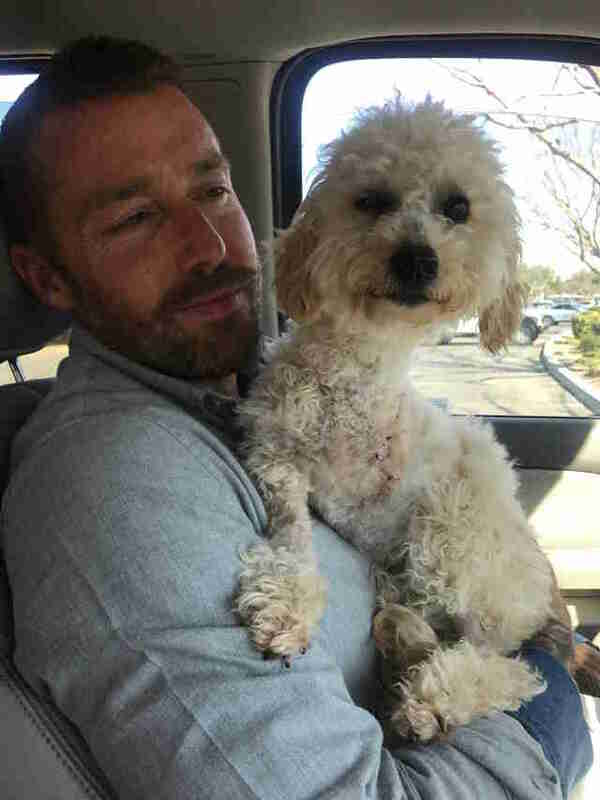 By the time Cora Rose was transferred to Marley's Mutts, a rescue organization founded by Zach and Heather Skow, her quality of life remained a question. One leg had already been amputated because of an infection — and she was about to lose the other, too. It was Valentine's Day when Zach and Heather met the fluffy little fighter who sorely needed a lot of love and care — and they were determined to give her a life worth living. But it wouldn't be easy. "We struggled with whether it was right to try to save her," Heather Skow told The Dodo. 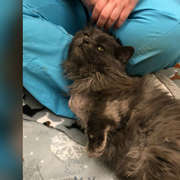 The Skows consulted veterinary experts and let Cora Rose, at the very least, begin her journey on what would be a long road to recovery — and she took it. #CoraRose could have buckled to the tragedy of losing her legs. Her outlook could have been "how unfortunate am I that I've lost my front legs and can't walk like others? ", "how sad is it I was abandoned by my family only to be hit by a car an nearly killed. Instead, her outlook has always been "how wonderful is it that I survived this tragedy and get to participate in life with people who love me?!". I have been feeling down pretty regularly--just part of an emotional depression--but she always helps pull me out and give me perspective. 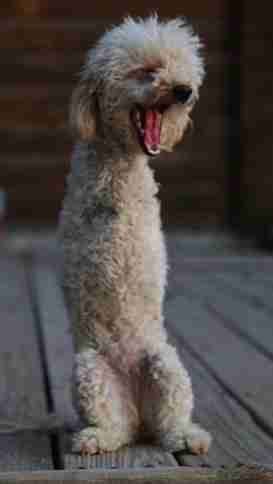 Dogs are medicine, they are teachers, they are guides to a full, fulfilling life, devoid of envy, pity and the burden of a "story". They rewrite their story every day and don't buy into what their story says they're supposed to be like. As Cora Rose healed, she started building strength in her back legs, and soon enough she was standing up and wagging her tail. 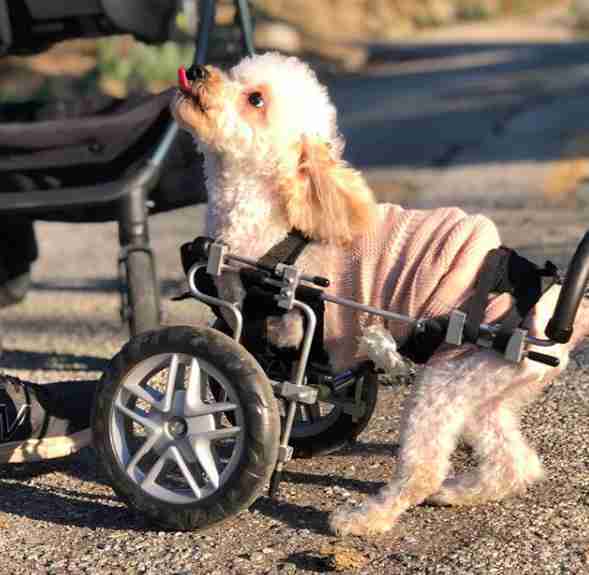 She got a custom wheelchair, too, so she can go to the dog park and really run. And most importantly, she became a big part of the Skow family. "She really, really thrived," Skow said. Cora Rose lives with Henry, a cat that's her best friend, and the Skows' three other dogs, and the Skows are constantly surprised by Cora Rose's "spirit and sass." Skow said that Cora even "bosses the other dogs around." The Skows have seen the positive impact Cora has on people she doesn't even know. Despite her painful past and her physical setbacks, Cora's upbeat demeanor has helped people realize that they can come through hard times too. But as brave and strong as she is, Cora Rose has shown that she's also, at heart, just a normal dog — and, in a certain way, that's what makes her so inspirational. 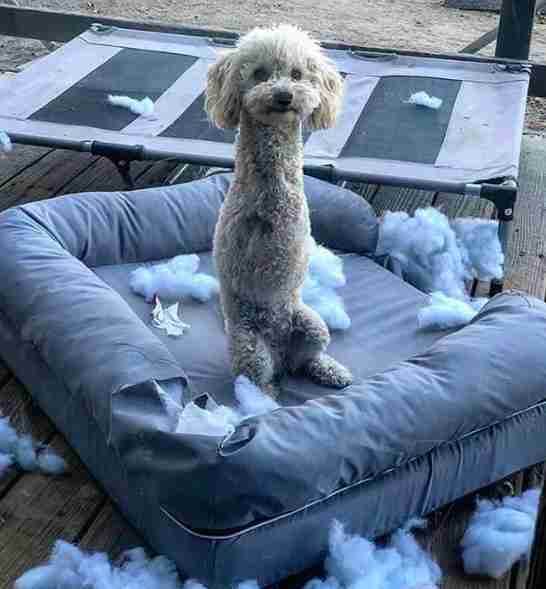 For instance, just the other day, Cora Rose was caught red-handed, standing in a pile of fluff and fabric scraps that once constituted a dog bed. She had obviously partaken in an old canine pastime: tearing things up. Y’all been asking for a #CoraRose update, so I humbly abide! 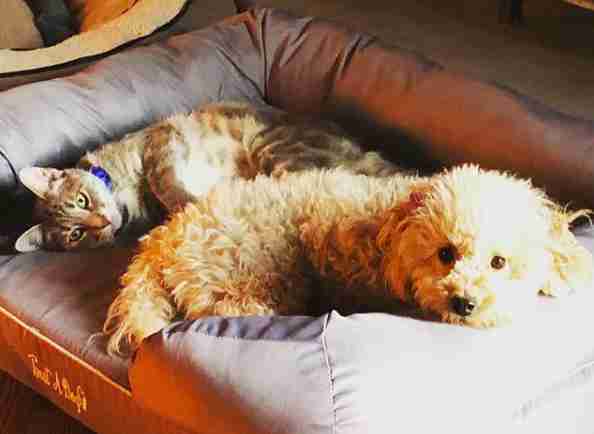 "She had help from her pit bull friend, Avery," Skow explained, about the dog bed debacle. "He started it and she finished it." "Anyone she comes in contact with, she puts a smile on their faces," Skow said. "She’s by far the happiest dog." You can help Marley's Mutts with all its lifesaving work by making a donation.